Was Friday a double-whammy record for the Antarctic ? Lowest sea-ice extent on record, and also the latest autumn rebound on record. One other thing to note about "bottoms" in general....both the Arctic AND Antarctic.....is that at some point.....maybe within 5 years....those bottoms will "broaden". And they will broaden because they will BOTH start earlier AND end later. And as we "run out of ice".....that "flat bottom" HAS to occur. Thomas Barlow: No, there was an even later rebound in 1986 when the official minimum date was March 6. The second latest rebound was March 3 back in 2003. This years minimum is very likely a tie with second latest rebound behind 1986. Since March 1 the daily gain have been almost 70K and nothing indicate that there will be any loss the next few days in the SIE around Antarctica. The most interesting question now is how quick the refreezing will be and if we are going to see any significant polar amplification given the very long period with open waters around Antarctica which has allowed heat to penetrate down into the sea. Thomas Barlow: No, there was an even later rebound in 1986 when the official minimum date was March 6. The second latest rebound was March 3 back in 2003...The most interesting question now is how quick the refreezing will be and if we are going to see any significant polar amplification given the very long period with open waters around Antarctica which has allowed heat to penetrate down into the sea. I thought we were in uncharted territory for a minute there. Small gains in the sea ice concentration data from Uni Bremen. only 40k above minimum but given: how late in season, usual smoothness of SH and 4 consecutive days of gains, I think we can call the minimum was 1st March. Yes, NSIDC SIC says basically the same. Out of the minimum, but as long as the gains are this slow, extent stays well below the rest of the "pack". 4) 2006 (purplish) has "lowest ever value for the date" between the 12th and 23rd of March, but ends up being outside the highest interdecile range by mid-August. 5) 1980 (yellow) then has the "lowest ever value for the date" until almost the end of May. 6) Looking at the second chart (end of May until mid November), for most of this period, 1980 continues to share "bottom billing", along with 1986 and 2002. (A few years briefly interrupt this three-way hegemony, but there's little to be gained by adding the additional "clutter".) However, by November 5th, 2016 moves into uncharted territory. Not much freezing in the Uni Bremen AMSR2 sea ice concentration. A small drop in extent according to Bremen AMSR2 sea ice concentration. What is JAXA seeing? They record a 47,514 km2 increase for yesterday. Refreezing according to NSIDC sea ice concentration was slow in the latest data. Bremen AMSR2 sea ice concentration shows solid increases for the first time. Your numbers confirmed my analyze after eyeballing todays SIE map, Wipneus. Weddell Sea is showing significant visible refreezing on the map. This should continue over the next couple of days as the forecast calls for continously cold or very cold weather in the southeast part of Weddell Sea. Overall, cold weather is foreseen to dominate over the next 5 days over most of Antarctica. The exception is the area from Ross Sea to Bellingshausen Sea where warmer than normal temperatures will prevail which should limit the ice growth there. Once these warm anomalies will be replaced by cold air from the interior of Antarctica we should see a rapid or very rapid ice growth. Refreezing somewhat slower than last year. Jaxa extent measurement now over 1 million km2 less than 2016. SST anomalies still high north of antarctic circle but air temps below average. Early days but worth watching refreezing season. 4 days out on Nullschool - 17th March - there is a fairly strong and warm northerly blowing on the Weddell Sea. This lasts for about a day and might cause some compaction of the spreading ice at the periphery, lowering the area. Abstract: "The proxy record of global temperature shows that the dominant periodicity of the glacial cycle shifts from 40 kyr (obliquity) to 100 kyr (eccentricity) about a million years ago. Using climate model simulations, here we show that the pace of the glacial cycle depends on the pattern of hemispheric sea ice growth. In a cold climate the sea ice grows asymmetrically between two hemispheres under changes to Earth's orbital precession, because sea ice growth potential outside of the Arctic Circle is limited. This difference in hemispheric sea ice growth leads to an asymmetry in absorbed solar energy for the two hemispheres, particularly when eccentricity is high, even if the annual average insolation is similar. In a warmer climate, the hemispheric asymmetry of the sea ice decreases as mean Arctic and Antarctic sea ice decreases, diminishing the precession and eccentricity signals and explaining the dominant obliquity signal (40 kyr) before the mid-Pleistocene transition." Abstract: "The proxy record of global temperature shows that the dominant periodicity of the glacial cycle shifts from 40 kyr (obliquity) to 100 kyr (eccentricity) about a million years ago. "... During the Quaternary Period, the total volume of land ice, sea level, and global temperature has fluctuated initially on 41,000- and more recently on 100,000-year time scales, as evidenced most clearly by ice cores for the past 800,000 years and marine sediment cores for the earlier period ..."
Nice to see some agreement. Here's what things look like using ADS/Vishop (ver 2). As usual, it's zoomed and filtered so that just the relevant low-ball years are displayed. One thing perhaps worth noting is the gap between the extent on 13th March this year and that recorded last year - currently sitting at around -1.1 million sq kms. It doesn't take an Einstein to realise that, as long as the gap stays roughly similar, the rolling 365-day average will drop by ~ 3k sq kms each day. The current (13 Mar 2017) rolling 365-day average using the ADS data stands at ~11.002 million sq kms, and should therefore drop below 11 million tomorrow. There are some data drops which require infill and the measurement periodicity alters, but, if my technique was at all reasonable [ ] the previous low for this metric was 11.090 million sq kms. This was clocked up around early August 1980. NB Using the NSIDC figures for Antarctic extent, the current rolling 365-day value is ~11.027 million sq kms, still some way above the equivalent value of 10.969 million sq kms recorded for early August 1980. Should the gap between this year and last year remain much the same, it will take about ~ 20 days to reach this record low value. 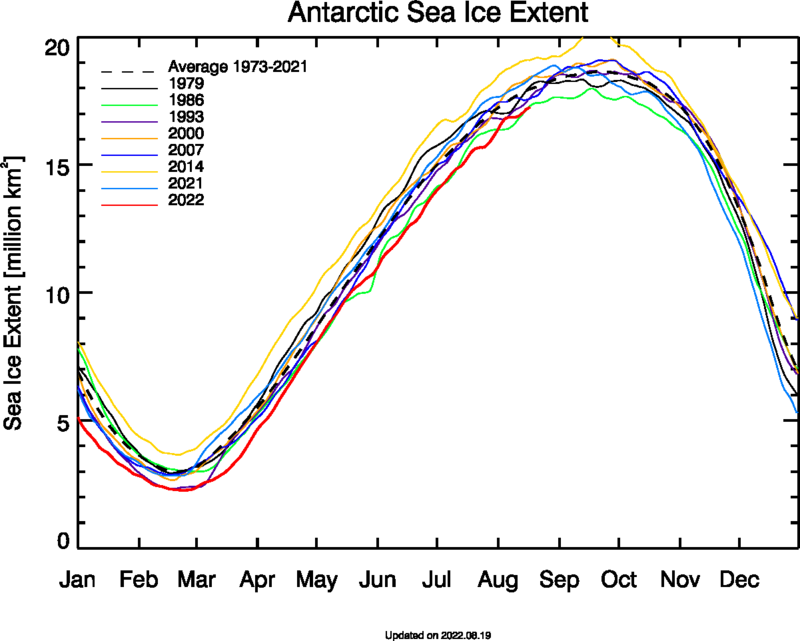 Antarctic Sea Ice is doing what the Arctic sea ice did this last fall and winter. 17th March - there is a fairly strong and warm northerly blowing on the Weddell Sea. Wipneus, any chance of daily updates on area for each region again? At the moment I am not calculating Uni Bremen automatically. The Uni Hamburg data are virtually the same ( same satellite measurements, same algorithm). On March 16 2017 jaxa measurement says antarctic sea ice 1/3 rd less than on March 16 2017. Difference currently increasing every day. Thanks for the links. I had browsed the start page and site map for your site but couldn't find links to this data. It appears that the Ross sea, and to a lesser extent the Weddel sea are the main reason for the slow growth. B) That is HUGE....not small. perhaps those should be 2 different dates ? .. gerontocrat / Buddy ? Perhaps 2014 was the comparison ? 1) I think he meant 2016 (last year). Sloppy of ME not to catch that. Good catch by you. 2) Difference is actually 30% (but 30% vs 33% is immaterial). On March 16 2017 jaxa measurement says antarctic sea ice 1/3 rd less than on March 16 2017 . Difference currently increasing every day. "3) Although 2016 (reddish) initially rises rapidly, such that it exceeds the median by around the 22nd March, it subsequently drops pretty low from mid-September onward. (That means there is a distinct possibility that the rolling annual average will plummet over the next few months.)" Although that related to NSIDC figures, the IJIS/JAXA/ADS numbers are pretty similar. By the 24th March, the 2016 figures had already reached and exceeded all of the 3 decadal averages. There is a bit more on the IJIS/JAXA/ADS numbers at #575. Given the extreme variability demonstrated by the Antarctic in the past, I'm still adopting a "wait and see" viewpoint. I think it's too early to say if this is purely down to specific weather conditions, or whether the sea ice in the Antarctic is starting to respond to climate change in an analogous fashion to its boreal cousin. However, a watching brief is definitely in order. can someone cut and paste that article? my browser will not open it because it considers the server insecure. I think their explanation fits fairly well to explain the exceptionally low SIE we have seen this season, and I agree with Bill, we have to wait and see what happens in the coming years given the very large yearly variability. ...we have to wait and see what happens in the coming years given the very large yearly variability. And given Hansen's feedback of melting glaciers resulting in increased sea ice around Antarctica. Should the WAIS mass loss continue to accelerate, there will be a large input of fresh cold water into the southern ocean. Very different from the Arctic, continent in the middle vs. ocean in the middle. Should the WAIS mass loss continue to accelerate, there will be a large input of fresh cold water into the southern ocean. Very different from the Arctic, continent in the middle vs. ocean in the middle. Yes. We also have increased strength of Westerlies resulting in increased Coriolis deflection, which obviously causes spreading in an equator-ward direction. In addition to that, the good old Clausius-Clapeyron relationship means that, thanks to the warming South Pacific, there will be a higher atmospheric moisture content, which in turn will lead to enhanced precipitation (snow and rain); both of these forms contribute to a temporary increase in sea ice area/extent. ... we have to wait and see what happens in the coming years given the very large yearly variability. Possibly the best example I can think of to back up that statement comes from the NSIDC monthly figures for Antarctic sea ice area. The year 2006 still has the lowest value for March in that dataset - at least for the next few weeks. However, by August, it had grown to 2nd highest - although that month has since been equalled once, and beaten 3 times. September 2006 was actually, although briefly, the highest for that month, and has been surpassed on 4 occasions. October 2006 also had the "highest for that month" status, but now trails in the wake of 2013 & 2014. Bizarrely, by December, 2006 had moved to 8th lowest area, and has only slipped one place since then. That is why neither LMV or myself are getting carried away at the moment by developments down there. Thanks for these updates during the season. Does anyone have the 2017 NSIDC/JAXA final lows (area, extent) and their comparison to the top ten previous years? So I simply observe that Antarctic sea ice has been several standard deviations below the average in the satellite record for some time. Methinks I was taught by my statistics tutor that the greater that deviation then the less likely it is that the observations were random chance. Which is why I still think keeping an eye on what's going on down south is of value. But what were the causes of such massive variations from the "norm" ? And what has been the effect on sea ice shelves exposed to open ocean in a way they have not been for a good many years? Today the 2017 NSIDC Antarctic area becomes lowest for the day. 1993 that was lowest at minimum by a wide margin is now #nine or so. The most interesting thing right now is how much impact the sun have had on the SSTs around the continent given the exceptionally low levels of SIE that have prevailed since the middle of November last year. The SIE maximum around Antarctica should most likely be quite normal by late summer/early fall but we might have a long period with SIE much below average. since antarctica is not surrounded by land i predict that in the not so far future the austral winter numbers in antarctic sea-ice extent will drop significantly while in the arctic it will take some more time until the basin won't be more or less filled with ice. last but not least land and ice-masses together keep that part cold in winter while warmer oceans will have their inmpact in the south rather directly. The re-freezing of Antarctica continues to impress by its slow pace. The current (March 22 Jaxa) measurement of extent of 3,038,106 sq km is now 1.3 million km2 less than the 1980s average (1980s being the lowest decade). This is an increased difference of 0.4 million compared with 20 days ago (the 2017 minimum). As DavidR pointed out, SST anomalies as far north as 60 S currently point to this continuing (caveat: all other things being equal). So on a risk analysis approach given the available data, I can see no reason for this year's maximum not to be very low (even though the variability from year to year in Antarctica is extreme, meaning all predictions have a low probability of accuracy ?). But, given the accumulated expertise gathered within ASIF, what do I know ? The re-freezing of Antarctica continues to impress by its slow pace. Not surprising. It is.....of course.....hard to discern "intermediate trends" from "short term trends"....but the long term trend is certainly in place. Right now.....warmish waters around Antarctica, especially in the Pacific. Wipneus: NSIDC reported a 39K DROP in SIE for March 22. Do you, or anyone else here, know whether this is unheard of or at least unusual? Which area contributed to the small decline? I think drops in (NSIDC) Antarctic extent during March have been recorded on 58 occasions. The arithmetic average of these drops is -28k, and the largest was -169k way back in 1979. Between the 10th and 31st March, there have only been drops on 22 occasions. Between them, April and May have seen 25 such drops. These averaged -22k, with the largest, -79k, happening in May 1986. HOWEVER, those numbers need to be qualified by the fact that daily recording didn't start until September 1987. Therefore, those two "big" drops were actually two-day drops. On the other hand, the total number of days showing a drop would likely be somewhat higher. I am probably EQUALLY interested to see what the Antarctic MAXIMUM will be this coming August/Sept.....as I am to see what this September's Arctic MINIMUM will be. The slowly warming oceans are clearly having an effect on both. Another Antarctic record low MAXIMUM would be a very bad message indeed. And if we head into another El Nino later this year...that would certainly not be good news. I continue to watch Wip's total sea ice area map with intense interest. Basic physics at work I'm afraid.